Where p and q are integers. a. Find the value of p and the value of q.
b. Calculate the discriminant of . c. On the axes on page 17, sketch the curve with equation showing clearly the coordinates of any points where the curve crosses the coordinate axes. We use method of “completing square” to obtain the desired form. Next we complete the square for the terms which involve . It is evident that it is a quadratic equation. To sketch a quadratic equation, a parabola, we need the coordinates of its vertex and x and y- intercepts, if any. First we find the coordinates of vertex of this parabola. 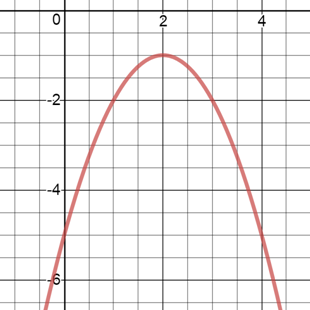 The graph of quadratic equation is a parabola. If (‘a’ is positive) then parabola opens upwards and its vertex is the minimum point on the graph. If (‘a’ is negative) then parabola opens downwards and its vertex is the maximum point on the graph. We recognize that given curve , is a parabola opening downwards. Coordinates of the vertex are . Since this is a parabola opening downwards the vertex is the maximum point on the graph. Here y-coordinate of vertex represents maximum value of and x- coordinate of vertex represents corresponding value of . For the given case, vertex is . Next, we need x and y-intercepts of the parabola. First we find the x-intercept of the parabola. The point at which curve (or line) intercepts x-axis, the value of . So we can find the value of coordinate by substituting in the equation of the curve (or line). Therefore, we substitute in equation of the parabola. Since this situation is not possible, there is no solutions and , hence, no x-intercept of the given parabola. Next, we find the y-intercept of the parabola. Hence, coordinates of y-intercept of the parabola are . We can sketch the parabola as shown below.